UPSSSC Yuva Kalyan Adhikari Admit Card 2018: Uttar Pradesh Subordinate Service Selection Commission (UPSSSC) is going to conduct the Yuva Kalyan Adhikari examination on 16th September 2018. In order to attend the examination, candidates applied for the posts have to download UPSSSC Vikas Dal Adhikari hall ticket. The hall ticket/admit card is the most important document to attend for the test. Applicants can get the hall ticket from UPSSSC Official website, upsssc.gov.in. On the homepage of the portal, the admit card link will be activated before few days of the examination. By just tapping on the link, aspirants will be able to download the hall ticket. After downloading the hall ticket, take a printout of it and place it in the safest file to carry it to the examination. Candidates must remember to carry admit cards while going to the examination. Otherwise, candidates will not be allowed to appear for the examination. Visit the UPSSSC Official website, upsssc.gov.in to download the admit card and for more information regarding the examination. 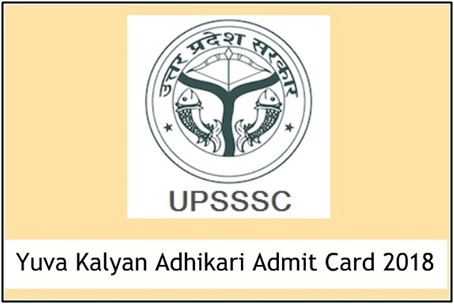 UPSSSC Yuva Kalyan Adhikari Admit Card 2018 : Uttar Pradesh Subordinate Service Selection Commission is the state level government organization that issues various job notifications every year. The UPSSSC selects the suitable candidates on the basis of merit. Yearly, the organization releases many of the notifications to hire the suitable candidates for various posts. A huge number of aspirants having the suitable educational qualification compete for the UPSSSC Posts to get the state government jobs. The organization has recently advertised 694 Yuva Kalyan Adhikari (Vikas Dal Adhikari), Exercise Trainer posts and accepted applications from eligible and interested aspirants. The application process was carried out from 22nd March to 20th April. Many of the candidates seeking to get state government jobs have applied during the application dates. The hopefuls will be selected through various rounds of selection process such as written test, physical eligibility test, and interview rounds. Aspirants clearing each round will be forwarded to the next round of selection process. The question paper will consist of 200 questions of 400 Marks. The time duration will be 02 hours (120 minutes). Aspirants applied for the UPSSSC Yuva Kalyan Adhikari Posts can get their respective admit cards 10 days before the examination. Yuva Kalyan Adhikari examination will be held at large number of examination centres across. All the applicants applied for UPSSSC Vikas Dal Adhikari posts will have to appear for the test on announced date. Candidates can download UPSSSC Yuva Kalyan Adhikari Hall ticket 2018 released. UPSSSC Vikas Dal Adhikari Hall tickets 2018 and observe the details of their examination center, date, and timings carefully from it. Also, aspirants must have to remember that, without admit cards, they will not be allowed to take the examination. Hence candidates must carry the admit cards while going to the exam. Recheck twice before going to the examination. Search the UPSSSC Yuva Kalyan Adhikari Hall Ticket download link in organization website. Check the information in UPSSSC Yuva Kalyan Adhikari Hall Ticket 2018.